Henry Sugimoto Self Portrait in Camp, 1943. At the age of 19, Henry Sugimoto left Japan to make his life in America. 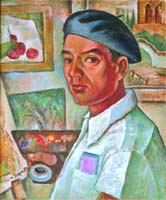 Determined to become an artist, he studied in the San Francisco Bay Area and exhibited nationally and internationally.When he was unjustly incarcerated at 42 in the Jerome and Rohwer concentration camps in Arkansas, the experience irreversibly affected how he viewed himself, his art, and the Japanese American experience. The only thing that remained constant was his desire to paint. This retrospective survey features works from the National Museum’s extensive collection of Sugimoto’s paintings, prints, drawings, and writing, and spans the entirety of his prolific career as an artist. Henry Sugimoto: Painting an American Experience tells the compelling story of an immigrant, a Japanese American, and an artist. View paintings from the Henry Sugimoto Collection online. Lecture and Book Signing at the Crocker Art Museum in Sacramento, California. Kristine Kim, lead curator of the exhibition Henry Sugimoto: Painting an American Experience, will present the life and art of this incredible artist in a slide lecture at the Crocker Art Museum in Sacramento, California. Inmates of America's concentration camps carved bird pins out of found wood. Participants will examine bird pins on display in the exhibitions, Henry Sugimoto: Painting an American Experience and Common Ground: The Heart of Community. Who made them and why? Following this activity, children will learn how to draw and make simple carvings of bird pins. Appropriate for children ages 6-12 years old. Cost: $5 for Museum members, $11 for non-Members. Join curators Kristine Kim and Karin Higa as they share their experiences uncovering new information during their 10-year journey to organize this exhibition. Celebrate "Grandparent's Day" at the National Museum! Invite your grandparents to join us in honoring them for the special role they play in our lives. A fun & touching look at how grandparents enrich our lives. Includes an opportunity for children from the audience to share special stories about their grandparents. Special participation by artist Momo Nagano and her granddaughter, Hana van der Steur. This special curator-led Gallery Tour introduces the art of Henry Sugimoto to children and their families. Allyson Nakamoto, National Museum Educator, will lead a gallery tour exploring Sugimoto's life, followed by a unique hands-on workshop. Eddie Kurushima, professional artist, began studying under Henry Sugimoto while incarcerated in Arkansas. His story highlights the significant role art and art education played in the lives of Japanese Americans incarcerated in America's concentration camps. The panel also features curators Kristine Kim and Karin Higa. Emily Anderson, curatorial associate at the National Museum will discuss works on loan from Wakayama City, Sugimoto's birth place. A hands-on workshop conducted by artist Flora Ito will follow the discussion. From Wakayama, Japan to New York City, U.S.A.
Henry Sugimoto chronicled his life in memoirs written entirely in Japanese. Join lead translator Emily Anderson and Director of Education Yoshi Miki as they present an overview of Henry Sugimoto's life and art as revealed through his autobiography. Japanese language guided tours will follow. Ron Stroud, artist and the designer of the Henry Sugimoto: Painting an American Experience exhibition, will discuss selected works of Henry Sugimoto. This documentary features rare home movie footage of Sugimoto painting in Jerome concentration camp and the voice of Academy Award-nominated actor Mako. The panel discussion immediately following includes Director John Esaki, musician David Iwataki and Mako. Tea is a beverage tradition enjoyed around the world. Spend the afternoon learning more about the culture of tea! No reservations necessary. Learn more about the teas of Asia and the "New Asian" teas, such as boba, that have become so popular. Enjoy a sample sip of many kinds of hot & cold teas! Enjoy a reading of Allen Say's Tea with Milk. Followed by "tea with milk" and cookies. Add your weave to the group weaving project! In conjunction with the American Families: A Weaving by Momo Nagano display. Featuring: Kristine Kim, co-curator of the exhibition, Rick Moss, curator at the California African American Museum, Nelly Toll, contemporary artist and author of When Memory Speaks: The Holocaust in Art and moderated by Nancy Berman, Director Emeritus and curator at the Skirball Cultural Center. In honor of Father's Day, the National Museum presents this special opportunity to hear first-hand stories about artist Henry Sugimoto (1900-1990) from the perspective of his daughter, Madeleine. This program is held in conjunction with the exhibition Henry Sugimoto: Painting an American Experience and will reveal the person behind the art. Audience members will be able to participate in a question and answer period moderated by Exhibition Curator Kristine Kim. Emily Anderson, Curatorial Associate at the National Museum, will discuss selected works of Henry Sugimoto followed by a hands-on workshop conducted by Flora Ito, Education Associate at the National Museum. Cheryl Walker, artist and art instructor at Santa Monica Emeritus College and UCLA Extension art courses, will discuss selected works of Henry Sugimoto followed by a hands-on workshop. Artist Vicky Murakami will discuss selected works of Henry Sugimoto followed by a hands-on workshop. Join the National Museum for a Sunday of Art on our Children's Courtyard to celebrate the upcoming exhibition Henry Sugimoto: Painting an American Experience. Learn about different techniques such as pastels, print making, water colors, and mixed medium collage used by this important American artist. Try your hand at one or all of these techniques at a variety of art stations on our Children's Courtyard—you'll even have the chance to paint your own experiences on a large wall mural. Music and taiko performances will accompany you. Invite your friends—admission is free!